This book focuses on 50 of the most important entertainers in the history of country music, from its beginnings in the folk music of early America through the 1970s. 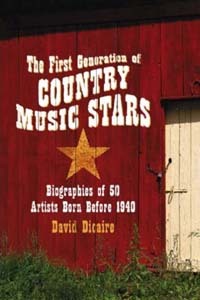 Divided into five distinct categories, it discusses the pioneers who brought mountain music to mass audiences; cowboys and radio stars who spread country music countrywide; honky-tonk and bluegrass musicians who differentiated country music during the 1940s; the major contributions that female artists made to the genre; and the modern country sound which dominated the genre from the late 1950s to the mid�1980s. Each entry includes a brief biography of the chosen artist with special emphasis on experiences which influenced their musical careers. Covered musicians include Fiddlin� John Carson, Riley Puckett, Gene Autry, Roy Rogers, Bob Wills, Bill Monroe, Hank Williams, Sr., Dale Evans, June Carter Cash, Loretta Lynn, Buck Owens, Roy Clark, Willie Nelson and Merle Haggard. David Dicaire is also the author of Jazz Musicians, 1945 to the Present (2006), Jazz Musicians of the Early Years, to 1945 (2003), More Blues Singers: Biographies of 50 Artists from the Later 20th Century (2002) and Blues Singers: Biographies of 50 Legendary Artists of the Early 20th Century (1999). He lives in Leamington Ontario, Canada.